Still wake up early, as do most of the crew (obviously seasoned pros at drinking, as no one shows any ill effects from last nights fun). While Rob C. (Henceforth known as ‘Stinky Rob’, or just ‘Stinky’) motored on the beach, Jeff, Steve and I headed to K58 for some breakfast. When everything is closed at K58, we swing north a few miles and find a great little place in La Mision – 3 tables, 1 lady working there (cooking, waiting tables, and cleaning). A hearty breakfast of chorizo con huevos and beans ensures we have adequate propulsion for flying later in the day. The ridge at La Salina is still socked in and the weather reports don’t show it clearing. So we elect to head south to try and find the ridge at San Antonio del Mar. This is supposed to be a primo soaring spot, with a 200 ft cliff right on the beach. We have the GPS coords and a general idea of where to go, so we head south. We pass through the tourist town of Ensenada (first stop for all the south bound cruise ships out of LA) and a couple of small villages before hitting our first military checkpoint. They waive us through, but the experience freaked out Brad. Supposedly, you are required to have a tourist visa to go south of Ensenada. We didn’t have them, but it really didn’t matter. A little over 3 hours after heading south, we find the turn off to San Antonio. The GPS says we are 10 miles away, but we spend the next hour trying to find the spot. The coast is completely fogged in, with only a couple hundred feet of visibility, making it hard to get our bearings. Steve works the GPS and naviates like a pro. We finally find the lower launch (60ft) and on it, 3 old-timers from LA camping. 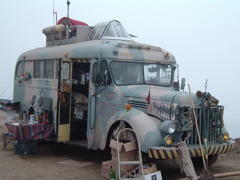 These guys have been coming to Baja on an annual camping trip for over 20 years and they had the coolest restored 1946 Army bus. Check out the photos. It was blowing in slightly and you could almost see the beach, so Brad decided to try his luck. A 60 foot sledder later and he was packing his glider up and hiking back to us. We packed it in after that and started the journey back north. The drive back didn't seem quicker than the one down, but maybe that was because Skybrake was driving. Again we were waved through the checkpoint, and again Brad was pretty nervous about it all. We did stop long enough to buy some cups of fresh sliced mango from the lady’s selling them at the checkpoint. They squeeze a bit of lime over them and dust them with chili powder. Yum! We stopped at Ensenada for groceries and made it back to Brent’s by 4:00 pm. We could just barely see the top of the ridge so we decided to do some recon to try and find the road to the top (and hopefully save us a hike when it was flyable). Jeff and I strapped on the motors and the rest of the team went in the truck. The plan was for us to fly up and find the road and radio control the truck to the top. By the time I covered the mile between the beach and the ridge, cloud base had dropped to almost ridge level and more low clouds were blowing in from the north. Jeff and I radioed the truck through a few back roads and a gated subdivision before base dropped to about 350ft and it got too rowdy for us to hang. We headed back to the beach and left the guys in the truck to finish the task of finding launch on their own. Turns out, we didn’t even have them close, but instead we had them on a dead end road up the wrong side of the mountain. Thankfully, when they crashed the gate into the subdivision, the security guards noticed them and were in hot pursuit. With Stinky’s asi-asi Spanish skills, the security guard was able to give them directions to launch. All this took about 2 hours after Jeff and I left going back to the beach, and we were out of radio contact the entire time. Finally, Jeff and I gave up waiting on the other guys and walked down the beach to the Baja Seasons for some dinner. We got in contact with the truck guys after they made their way down and they meet us for a late dinner. Not a great PG day, but everyone but Steve did fly at some point and we found the road to launch as well as how to get to San Antonio del Mar.